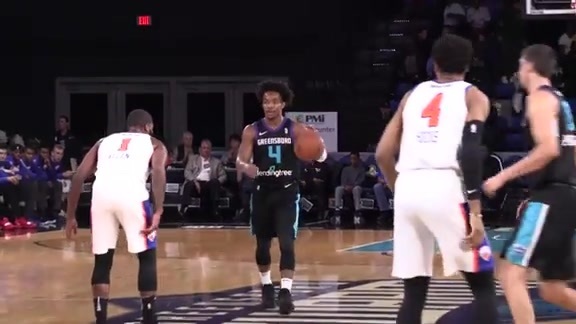 The Charlotte Hornets’ G League affiliate, the Greensboro Swarm, recently hired a former long-time professional player to its coaching staff who goes simply by “Coach C”. Her name is Chasity Melvin and she just happens to be the organization’s first-ever female assistant coach, in any capacity. But her story isn’t simply about a woman breaking down barriers and finding her place in a heavily-male dominated profession. It’s also the story of a competitive, passionate individual landing a well-deserved position in the sport she loves through dedication and persistence. The now-42-year-old Melvin was born in Roseboro, NC, which is located about 30 minutes southeast of Fayetteville. She used her 6-3 height and skillful game to quickly became a star at Lakewood High School and eventually landed a scholarship at North Carolina State University. Melvin joined the Wolfpack in the fall of 1994 under the watchful eye of late future Hall-of-Fame Coach, Kay Yow. When it was all said and done, Melvin finished her collegiate career as the program’s fourth all-time leading scorer (2,042 points) and third-leading rebounder (1,020). She was a part of four NCAA tournament squads while in Raleigh and helped lead the Lady Wolfpack to its only ever Final Four appearance as a senior in 1998. In her final game as a member of the program, Melvin finished with 37 points in a loss to eventual National Champion runner-up Louisiana Tech, earning herself a spot on the All-Tournament Team. After one season with the Philadelphia Rage of the women’s American Basketball League, Melvin was taken 11th overall by the Cleveland Rockers in the 1999 WNBA Draft. She went on to tally 12 seasons and a 2001 All-Star Game nomination in the league, also suiting up for the Washington Mystics and Chicago Sky. She would utilize her offseasons playing abroad for teams in far-away locations including Spain, Italy, Poland, Israel, China and Russia. Having spent so much of her career competing and moving about to various organizations, Melvin hardly had any time to prepare herself for life after basketball. Fortunately for her, the NBA Assistant Coaches Program had been established back in 1988 to assist many former male and female players with breaking into the profession. Alums of the program include James Posey, Jerry Stackhouse and Vin Baker, all of whom are now NBA assistants. After a few years working in a private sector and coaching high school basketball on the side, this aforementioned opportunity finally presented itself to Melvin thanks to former WNBA teammate, Stacey Lovelace, who is currently a Player Development Program Officer for the NBA and G League. Melvin took advantage of her new-found situation and landed a position working at the Portsmouth Invitational Tournament this past summer, which serves primarily as a pre-NBA Draft camp for college seniors. The experience set in motion a path that ultimately ended in Greensboro. “Once I got the opportunity to coach in Portsmouth with the seniors – that was my first time ever coaching men – it just lit a fire under me. It fueled my competitive drive. I was like, ‘Okay, this is where I belong. I want to coach men.’ So, I made it a goal. The Greensboro Swarm and Windy City Bulls had opportunities and they wanted a former player to take one of their last positions on the coaching staff. They worked with the NBA Assistant Coaches program and I got an interview and I rocked it out,” she said with a big smile. Melvin had spent plenty of her free time prepping for a potential coaching interview, even it meant staying in while others were out and about. She hopes to take plenty of what she learned during her traditional 9-to-5 job and incorporate it back into her coaching duties. Aside from her competitive nature and deep basketball knowledge, she plans to use her unique journey as another asset in Greensboro, something many G League players in particular can relate to. Melvin was in Chapel Hill, N.C. for Hornets Training Camp last month and said she was not surprisingly treated just like any other coach. Notably, Hornets Head Coach James Borrego was on the San Antonio staff with another former WNBA alum in Becky Hammon, who was hired as the NBA’s first full-time female assistant coach in 2015. In addition to Hammon, Nancy Lieberman has been on the Sacramento Kings’ staff since 2015, which also included former WNBA Head Coach Jenny Boucek last season. Boucek was recently hired as a full-time assistant for the Dallas Mavericks, while Karen Stack-Umlauf (who is coincidentally Hornets center Frank Kaminsky’s aunt) is an Associate Coach and Director of Team Operations with the Chicago Bulls. A female coach working in men’s professional sports certainly isn’t (or at least shouldn’t be) considered as ground-breaking a development in today’s world as opposed to say 50 years ago. But Melvin’s hiring does open the door more to some degree for female coaches looking to get into the NBA or G League. Even though she sees herself just as Coach C, Melvin hopes her experience can provide motivation for others in similar situations – male or female – down the line. It’s certainly a season of change in Greensboro with an almost entirely different roster and a brand-new coaching staff led by the NBA veteran Wolf and additional assistants in Dan Tacheny, Evan Harville and Dave Kenah. Chasity Melvin’s background and attributes might be a tad distinctive in some ways, but the only thing that really matters is that she’s simply a basketball coach and an extremely qualified one at that.